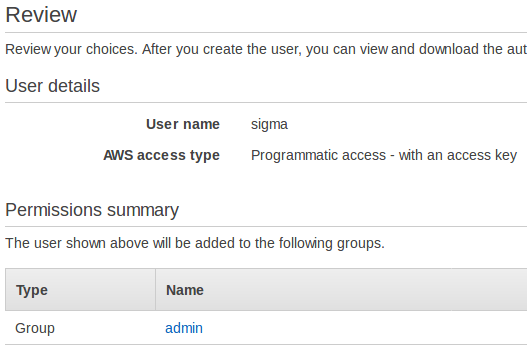 Before firing up Sigma, you need to create/obtain AWS access credentials for allowing Sigma to access your AWS account. Sigma will perform a wide range of tasks on your behalf, including building and deploying your app into your AWS account, so for the moment it needs unrestricted, full administrator access to your AWS account (however, we do have future plans for preparing a minimal, more restrictive set of permissions). Here you will allow Sigma to act as your AWS IAM root user for gaining the required access. Although Sigma will never share your credentials with other parties (and persist them only if you ask it to do so, with full encryption), using root user credentials is generally discouraged; it is also against the AWS IAM best practices. Open the Security Credentials page of the IAM dashboard. 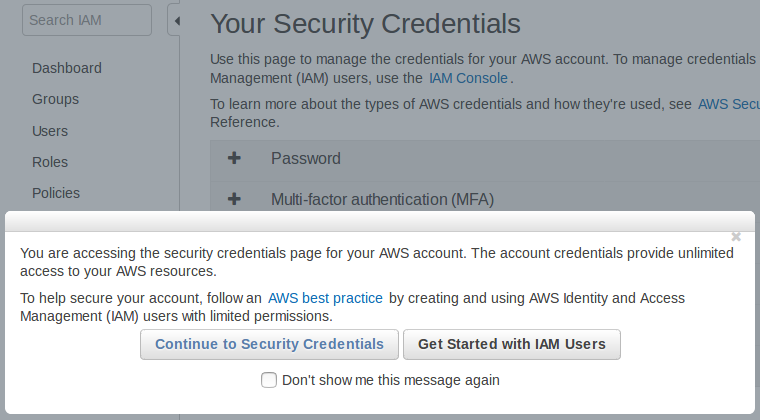 If AWS asks for your confirmation, click Continue to Security Credentials to proceed. Click Access keys (access key ID and secret access key) among the list of accordions on the right pane. Click the Create New Access Key button. A pop-up will appear, stating that your access key has been created successfully. Copy both of the above values to a secure location (or click Download Key File to save them to your filesystem). The detailed version is here. 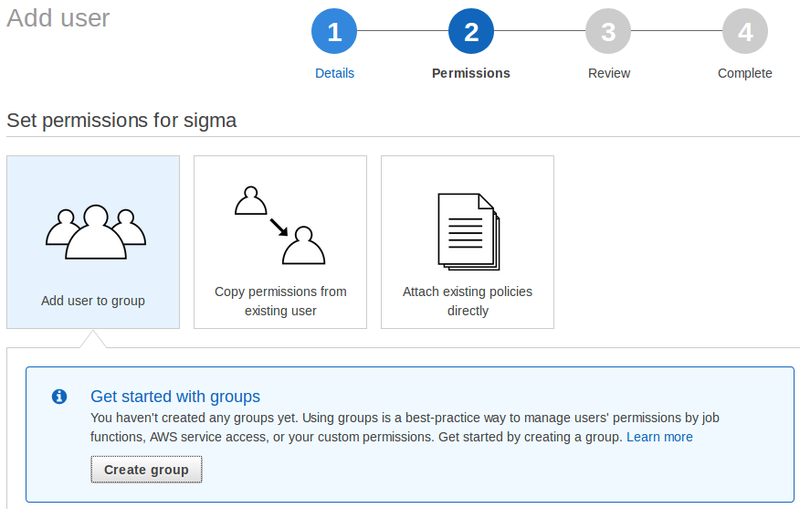 Here you will create a new administrator group inside your AWS account (if one does not already exist), create and assign a new user to that group (so that the user would have administrator privileges on your account), and feed that user&apos;s access credentials to Sigma. This way, you can instantly revoke Sigma&apos;s access anytime by disabling/deleting the access keys of the new user. Go to the IAM dashboard. Select Users on the left pane. Click the Add user button at the top of the right pane. Type a name (e.g. sigma) for the User name field. Under Access type, tick Programmatic access, and click Next: Permissions at the bottom right. You can skip the next 3 steps if you already have an administrator group in your AWS account, directly assigning that group to the new user in the 4th step. Click Create group under the Add user to group option. A new pop-up will open. Type a name (e.g. admin) for the Group name field. Click Create group. The pop-up will close, and the new group will appear in the groups list of the permissions page, already checked (ticked). Double-check that your user has the correct name, and that he belongs to the new group you just created. If all looks fine, click Create user. Copy both Access key ID and Secret access key to a safe location (or click Download CSV above). Here&apos;s the official, detailed version. Once you follow either of the above methods (and have an access key-secret key pair in hand), you can feed the obtained credentials to Sigma in order to make it functional against your AWS account. Go to the Sigma sign-in page. Click the Create an account link against the New to Sigma? message. Fill in your first and last names, email, and phone number. Take note of your username: Sigma will automatically generate one, using your first and last names. You are free to change this to your own preference, as long as another user has not used it already. Choose a password. Passwords in Sigma need to be at least 8 letters long, and have at least one from each of: uppercase, lowercase, numeric and symbolic (@, $, # etc.) character categories. (For example, Password#123 minimal (but very insecure) example.) You can press and hold the show password button (eye icon) to confirm what you have typed. When all looks good, click Sign Up. If Sigma succeeds in creating your account, you will be taken to a confirmation page (Insert Confirmation Code). An email will be sent to the address you indicated (from noreply@slappforge.com), with a verification code. Check your mail for the verification email (including promotions, spam, trash etc. in case it does not show up in the inbox). Once you find it, copy the 6-digit confirmation code in the email, paste it into the confirmation page, and click Confirm. If all goes well, you will see a Confirmation successful! message, with a link back to the sign-in page. Go to the sign-in page, and log in using your username (that you took note previously, during sign-up) and password. After sign-in, you&apos;ll be in the AWS Credentials page of Sigma. Copy the access key ID and secret access key that you retrieved from the AWS console previously, and paste them in the Access Key ID and Secret Key fields, respectively. Sigma can store the credentials on your behalf, so that you will not have to re-enter them at every log-in. The keys will be encrypted with your own password (both your password and keys will be managed by AWS Cognito, AWS&apos;s own user management service, so the Sigma administrators will also not be able to access your password or keys), hence Sigma authors, or any other third party, will not be able to confiscate your credentials. If you are not comfortable with the above, you can simply avoid the store option by unticking Save Credentials. When done, Click Load Editor. 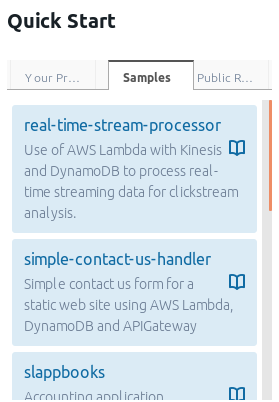 Now you will be in the projects page, with a quickstart pane (displaying the text Integrate Sigma with GitHub!) on the left. Click the Sign in with GitHub button. A GitHub authorization window will pop up (if it does not, tune your browser to enable pop-ups for sigma.slappforge.com and try again). On the pop-up, sign in to GitHub if you are not already signed in. The pop-up will ask you to authorize the Sigma GitHub app (made by slappforge, the author of Sigma) to connect with your GitHub account. Click the Authorize slappforge button to continue. Your Projects tab will display any Sigma-compatible projects that are already in your GitHub account. Samples tab will display the numerous samples published by SLAppForge, that you can try out right away. 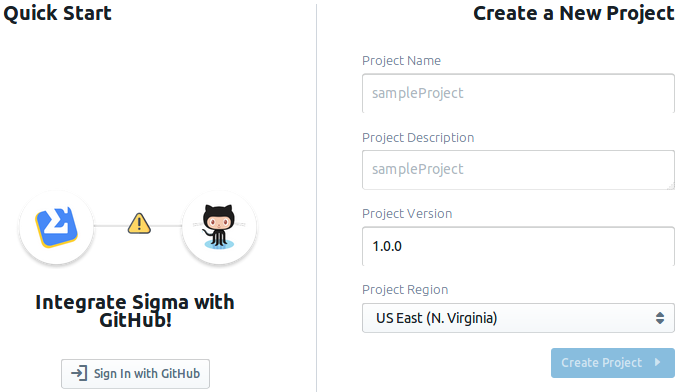 If you have the GitHub URL of any other Sigma project that you know of, you can simply paste it in the search bar of the Public Repositories tab and hit the search button, to load it. Once you have found the desired project, click the list entry to load it into the Sigma editor. Alternatively you can create a new project by filling in the project creation form on the right side pane and clicking Create Project.